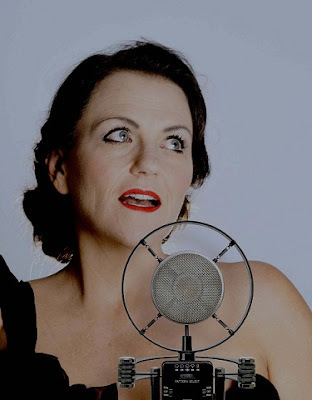 A Nightingale Sang …… A Tribute To Vera Lynn certainly brings a change of pace to the Durban’s Rhumbelow Theatre. After a series of up-tempo foot-stomping hand-clapping tribute shows, the entertainment changes to a sophisticated and elegant cabaret style presentation. If ever there was a performer who could be called iconic it must be Dame Vera Lynn. This enormously popular singer, whose warm and gracious voice had such an enormous impact on the British nation in its darkest hour, turns 100 hundred years old in March this year. Dame Vera Lynn, widely known as the “Forces Sweetheart” was an English singer, songwriter and actress. Her musical recordings and performances were enormously popular during the Second World War. She toured widely entertaining the troops. At the age of 92 she became the oldest living artist to top the UK Albums Chart with her compilation album, We’ll Meet Again. It even out sold the Beatles. The sub-title to this show, A Tribute to Vera Lynn, is slightly miss-leading. It not only pays tribute to the songstress but also celebrates the indomitable spirit of the British people during the Second World War, a time when Vera Lynn was at her most influential and popular. The highlight of the production for me was to see the sublime Lisa Bobbert once again mesmerise her audience with her performance. Playing Vera Lynn, she displayed passion and emotion which brought the character to life. It was an enchanting performance.by a consummate artist. She was ably supported by Anthony Stonier who used his strong baritone to good effect in singing not only a few of Lynn’s songs but also a few other hit numbers of the era. However, he perhaps needs to brush up a bit on his script because at times he seemed to be a little at sea while delivering the biographical links. On the piano, and providing vocals, was the accomplished and debonair Evan Roberts. While his prowess on the piano is well known, this is the first time I have heard him sing, and I enjoyed his unusual voice very much. Included in the show were most of Dame Vera Lynn’s most popular songs such as We’ll Meet Again, The White Cliffs of Dover, We’ll Gather Lilacs, There’ll Always be an England and, of course, A Nightingale Sang in Berkley Square. The music is linked with interesting biographical and documentary information, delivered by the performers. There is also use made of audio clips such as Chamberlain’s declaration of war against Germany and excerpts from Churchill’s speeches. There will be two performances today, March 19, at 14h00 and 18h30and also two on Tuesday March 21 at 14h00 and 18h30. Tickets R150 (R130 pensioners). Contact Roland for large group booking discounts for 20 or more. Braais will be available should you wish to cook some meat. A bar is also available (no alcohol may be brought on to the premises) and there is limited secure parking available.